Indonesia currency is Indonesian Rupiah IDR and its worth about US$ 0.0001. So you get about IDR 10,000 for US$ 1. A few years ago Indonesian money was more worth than nowadays. People in Indonesia keep struggling with their value of money. Especially for poor people, they can barely keep up the worth of money. Everything such as rice, sugar, oil, the main needs of Indonesian people are keep rising in price because the value of money are going down. The most frequently money that we are used is banknotes because the most prices are about thousands. The banknotes begin with IDR 500 until IDR 100,000. Coins are less used, but at the market or small restaurants or shop, the coins such as IDR 100, IDR 200, and IDR 500 are regularly used. If you want to exchange money in Indonesia, you've better to choose general money changer, GMC, that you can find everywhere in the big city. The currency is higher than the bank, so you get more money if you change it at GMC. Check out regularly for the openings time for the GMC. Usually they are open until 12.00 am. And if you want exchange money, try to do that in the big cities. The bigger the city the bigger is the currency. The money that you want to change has to be nice, not dirty or a little bit broken, check out for the details, or else they don't want to accept your money. And they want only paper money which has a high value for them, started with $20 for example. Lower than this, they will probably reject that. Check out your money in Indonesian Rupiah. 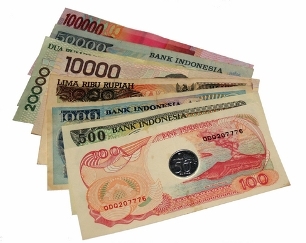 Choose your currency and convert to Rupiah, and you will know in seconds how much your money worth.